It's been another action-packed month in the doggie world. We'd half finished the magazine but had to have a rethink after Ashleigh and Pudsey's famous victory in Britain's Got Talent! Claire Horton-Bussey probes into microchips and whether they really will bring your dog home or indeed do anything to stop people being bitten by dogs. Some remarkable and disturbing stories. Are huskies the new Staffies? As these gorgeous but demanding dogs start mounting up in rescue we look at what you need to be an owner and give some of these hard to home dogs a run in our Adopt Me section. Do look out for Hope in that section, too. A disabled dog in Uganda hoping that someone here will give her a loving home. Shouldn't single one dog out, but that's a very big ask. Karen Cornish makes us all feel Itchy and scratchy with a in depth look into finding the cause of that itch and how to get rid of it! Victoria Stilwell shares her top tips as to what to do if you've got a dog who is poo peckish! Our lovely vet Richard Allport gives you some hints on what to put in an alternative first aid kit. Terry Doe sticks up for all Bull terriers when faced with a bigot. Sarah Whitehead on what to do with a dog that chews - great classic Kevin Brockbank illustration for all his fans! Insurance guru Neil Flint talks about the banking crisis and we reveal how our camapign is going. If you read my editorial you'll be very sad to hear it comes to late for Oscar the Bernese Mountain Dog who was put to sleep before the U turn. 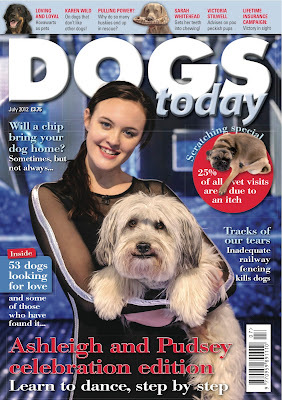 I write about Ashleigh and Pudsey's amazing performance and claim it as a win for positive training generally! Gina Stokes (Was Graham until she got married in February) shows everyone who got the dancing bug some steps to learn at home! More next month. Allen Parton and EJ, Rookie and Clooney make history when the three dogs become the first dogs allowed into Queen's College Cambridge! Karen Wild gives advice to those whose dogs really don't like meeting other dogs - whether they are the bully or the bullied! Take part in I Want One: Win a fantastic and stylish Joules dog bed, a cooling tshirt from Equafleece, a new foam dog wash from NewGenn that's as kind to your hands as it is for your dog's skin, a precious pawprint keyring worth £60, an antler dog chew and a dog walking guide of your choice. 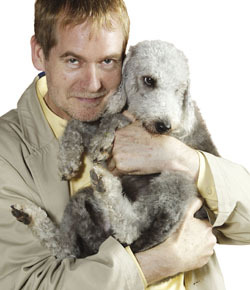 Peter Neville takes on a case of a dog with terrible separation anxiety and gets him ready to go into a necessary stay in kennels. Lynn Allardyce transforms a grumpy reactive German Shepherd into a cuddly teddy bear! We feature the stories of dogs that have been killed or injured on unfenced railtrack and encourage people to sign the petition to stop it happening in the future. Updates on Don't Cook Your Dog campaign and the Dogs Dinner. Really touching story of Jaxx the Mastiff cross and the joy he brings to the family that rescued him's lives. Our appeals page is a real heart wrenching edition - some amazing dogs that have been through so much and now need our help. And there is so much more! There's Think tank, the news, the regular columns and competitions.